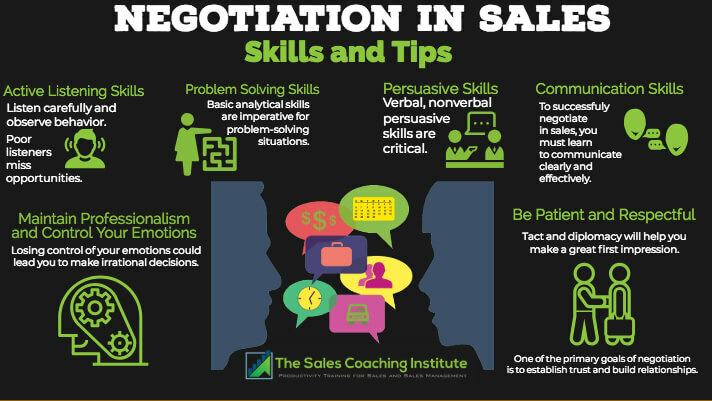 Negotiating in sales is one of the most fundamental aspects of selling. Every sales professional will spend the majority of his/her career negotiating with either their customers, employees, and even themselves. Getting other people to see things from your perspective while listening to their point of view in an equally respective manner is a key aspect of acquiring new customers, retaining profit, and building meaningful relationships in business. It can also be the most frustrating. Negotiation is an art form that requires working with someone or groups with different views in order to create a mutually beneficial agreement. Remember that your counterparts are human beings and not just another sale. They have their own feelings, opinions, values, and backgrounds that influence what they say during the negotiation. To solve this problem, imagine the situation from their perspective. When you are negotiating with someone who is firm in their position, ask them how things are working out for them. This allows you to gauge their point of view more clearly and can help you avoid resorting to blaming tactics during the negotiation process. Often times negotiations begin with both parties coming out strong with their positions which leads to a deadlock. This can be difficult to get out of because you are left with little room to negotiate. A better stance to take would be to ask questions about their interests and what motivates their position. You can ask them why a particular stance is important to them or probe them for more details. Prioritizing interests gives you a chance to share your own which can open up more opportunities to explore each other’s problems allowing you to create a solution that benefits both parties. Allow yourself and your counterpart to be honest with any strong emotions you feel during the negotiation process. Give ample time for them to honestly speak their mind. Emotions get in the way of looking at the problem for what it is. Taking turns to express your feelings without interrupting lets you listen better to what is being said and can prevent arguments from getting out of hand. Expressing appreciation can help to open up your counterparts during the negotiation process. Understanding where others are coming from and highlighting key points in what they are trying to communicate shows that you are listening. It also shows that you respect what they are saying and where they are coming from. It is imperative when negotiating in sales that you remain calm and relaxed. You want to inspire their emotions and control yours. Remember to think about objectives over objections. Over time the experience you gain from negotiating in sales will allow you to incorporate a unique style and flair but keep these 4 key principles of negotiation in mind on your next deal! If you would like more information on how to sharpen your negotiation skills, read about our Negotiation for Sales Professionals Workshop!